I just returned from a two day visit to Omaha, Nebraska to visit with Warren Buffett at Berkshire Hathaway. I took along 50 of my fellow MBA classmates. As expected, the Sage of Omaha was full of humor while dispensing his unique, masterful thoughts on business and life. Unlike most student visits to Omaha, this one was unique in that we had extensive access to Mr. Buffett...nearly seven hours over the course of two days. Most schools consider it a major coup to score 2 hours with him and others spend tens of thousands of dollars for a two hour lunch with Buffett (see eBay for future lunch dates). 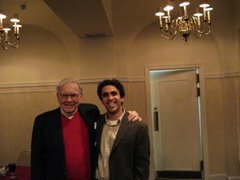 The time was priceless...we spoke of the early years with Buffett working for Ben Graham, the formation of the legendary partnership in 1956, his remarkable gift to the Bill and Melinda Gates foundation, and of course, investing. The notes of this trip will be available on this blog shortly. For now, I will share some highlights of the meeting. Buffett: "It's a structural issue...yes, with a small sum like a million dollars, I could make 50% or more a year. The key is rationality. There are always going to be times when humans act irrational and this is time to make your money. I've made a career of cashing in when people act irrational." If you consider some of Buffett's most successful investments--American Express, the Washington Post Company, and Gieco--they were all made during the absolute worst times for these companies. Times when nobody wanted anything to do with them. Buffett: "A couple of years ago I got this investment guide on Korean stocks. I began looking through. It felt like it was 1974 all over again. Look here at this company...Dehan, I don't know how you pronounce it, Flour Company. It earned 12,879 won previously. It currently had a book value of 200,000 won and was earning 18,000 won. It had traded as high as 43,000 and as low as 35,000 won. At the time, the current price was 40,000 or 2 times earnings. In 4 hours I had found 2o companies like this." "When you invest like this, you will make money. Sure 1 or 2 companies may turn out to be poor choices, but the others will more than make up for any losses." It's critical to understand the mental model Buffett has going into these investments in Korea. A portfolio of carefully selected stocks in understandable businesses trading at very attractive valuations generate abnormal returns. While I don't have Buffett's personal investment record, I am certain he was making 40-50% returns in Korea simply by choosing a portfolio of stocks with strong earnings records trading at very low multiples to earnings. Ironically, this model is not new...it was actually revealed by efficient market advocates Fama and French in there three-factor model. Over time, low P/E, low book, small companies tend to outperform. Apply a little more intensity, as Buffett is famous for doing, and you can make lots of money. One of Buffett's most successful international investments was PetroChina, China's largest oil producer. Buffett: "The whole company was selling for $35 billion. It was selling for one-fourth of the price of Exxon, but was making profits equal to 80% of Exxon. I was reading the annual report one day and in it I saw a message from the Chairman saying that the company would pay out 45% of its profits as dividends. This was much more than any company like this, and I liked the reserves." "I was considering buying this company, but I was also looking at Yukos in Russia. This was cheap, too. I decided I’d rather be in China than Russia. I liked the investment climate better in China. In July, the owner of Yukos, Mikhail Khodorkovsky (at that time, the richest man in Russia) had breakfast with me and was asking for my consultation if they should expand into New York and if this was too onerous considering the SEC regs. Four months later, Khodorkovsky was in prison. Putin put him in. He took on Putin and lost. His decision on geopolitical thinking was wrong and now the company is finished. Petro China was the superior investment choice. 45% was a crazy amount of dividends to offer but China kept its word. I am never quite as happy as I am in the US, because the laws are more uncertain elsewhere, but the point is to buy things cheap." Once again, "the point is to buy things cheap." Because the company is not in the U.S., Buffett applies more filters before committing capital. "So we own 1.3% of this company and it cost us around $400 million. Now it's worth $3 billion." Look closer and you can see the real value in this investment...the dividend payout. When Buffett made his investment, PetroChina was paying a dividend of close to 9-10% (I know because I bought some shares the minute I heard of Buffett's stake and about 5 minutes of my own research.) At the time the stock price was about $30 per ADR, but Buffett purchased H shares directly in China at a lower price. The stock currently trades at about $125 per ADR and yields 5%...you do the math...about $6 per share on a $30 cost basis or even lower...margin of safety? Buffett also had a copy of the 1951 Moody's Banking and Insurance Manual. "There were four Moody's manuals at the time. I went through them all, page by page, over 10,000 pages. On page 1433, I found Western Insurance Securities. Its earnings per share were as follows: 1949 - $21.66, 1950 - $29.09. In 1951, the low-high share price was $3 - $13. Ten pages later, on page 1443, I found National American Fire Insurance (“This book really got hot towards the end!”) NAFI was controlled by an Omaha guy, one of the richest men in the country, who owned many of the best run insurance companies in the country. He stashed the crown jewels of his insurance holdings in NAFI. In 1950, it earned $29.02. The share price was $27. Book value was $135. This company was located right here in Omaha, right around the corner from I was working as a broker. None of the brokers knew about it. This book made me rich."